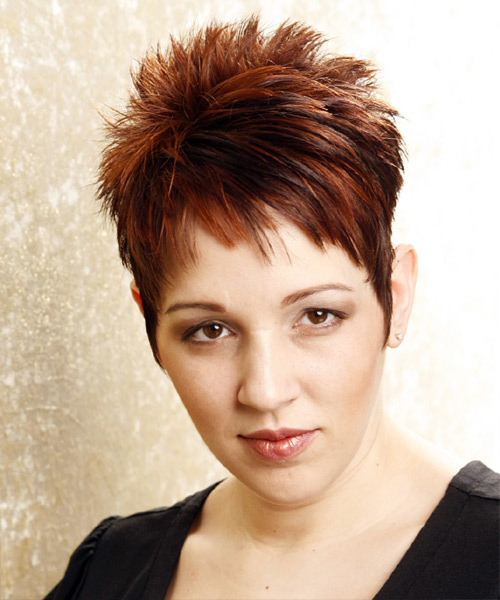 Hairstyles that add width at the chin area such as chin length bob cuts or shoulder length wispy kicked out looks. Styles that tuck in behind the ears also work well to show off a wonderful cheek bone structure. Hairstyles with straight across bangs will also work to shorten long faces, as will side parts. Try and avoid short hairstyles with height on top, particularly ones without bangs. Avoid styles that leave no hair on the neck area or the chin area. Middle parts will add length so they should also be avoided. 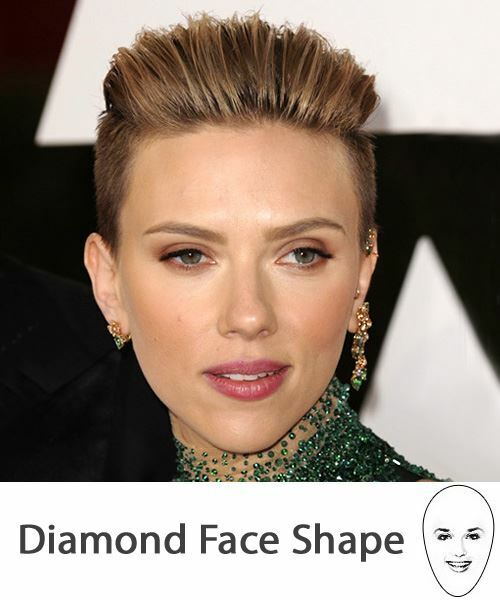 This shows a good example of what hairstyle suits diamond face shapes. The bangs help to shorten the length of our models face which is what is needed for diamond faces. The side part helps make the face appear wider by creating the illusion of one larger shape which the eye focuses on. The sides are soft and wispy and curve into a round shape. Variations of this hairstyle will work in any other texture. This short hairstyle is all wrong for diamond face shapes. The height created on top (particularly in a middle pointed way) only emphasizes a diamond shape. The short bangs also only add to the illusion of height. What is needed is width rather than height. This hairstyle shows what not to have! Now this is a nice look. The bangs immediately shorten the overall length of the face while the soft layered sides fall nicely to the shoulders drawing attention away from long lines. This shape will work equally well on wavy and curly textures and is a very good example of what to wear! 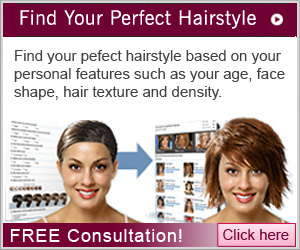 This hairstyle shows how important face shape selection is when it comes to choosing any hairstyle. The middle part actually makes the face appear longer while the wispy layers seem to fall nowhere in particular and appear lifeless. The absence of bangs makes the face appear longer than it really is. While the right bangs make a great addition to any hairstyle and can turn an average look into a head turner, the wrong bangs can change your face shape and add unnecessary styling time to your mornings as you struggle to make unsuitable bangs look good. To avoid such extremes and getting bangs you'll regret, do your research first and choose the right bangs by looking at the ultimate deciding factor – your face shape. To make the most of a diamond face shape your bangs should help to shorten the length of your face to achieve a much more flattering shape. The length of these choppy bangs will immediately shorten the length of a diamond face shape and the side-swept styling of the bangs creates a soft and flattering look. Straight across bangs that reach your eyebrows will cover up the top half of your face, reducing length and width. The length of a diamond face shape can very easily be exaggerated by the wrong bangs so anything that is going to add unwanted height to your long face should be avoided. Short bangs that stop above your eyebrows will instantly lengthen your face. 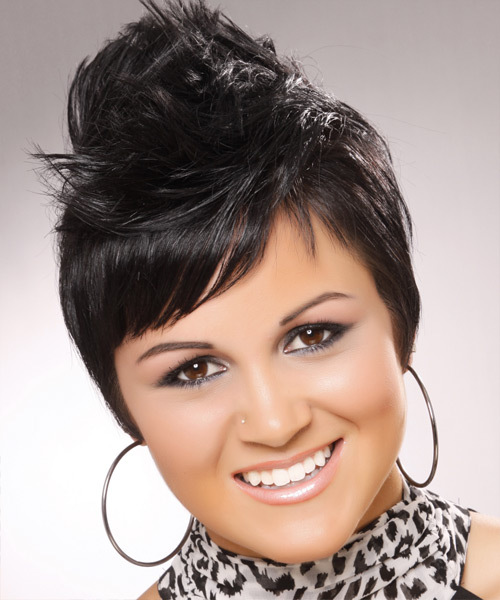 Super short bangs like these mini bangs will give the illusion of height, adding length. Bangs are really suited to long face shapes so including them as part of your hairstyle can really create a great look for you. Warm colored blusher applied above your eyebrows, blended up to your hairline and on and under the pointiest part of your chin will reduce the length of your face. Using pale, silvery eye shadow over your whole eyelid will give the illusion of width. The shadow should also be blended to the outer corner of your eye to the brow. Finish with some eyeliner softly smudged along the line that runs across your eye socket. Blend highlighter underneath the full length of your brow and a pale eye liner under your eye from the inner corner to the middle. Combine this with a softly smudged pencil line under your lower eyelashes and then take it out to a lightly extended line for width. Apply some highlighter on and under your cheekbones to create width. Add some blusher just below your cheeks and then blend it across the width of your cheeks. This will add emphasize to the width across the center of your face. A pale lipstick is great for creating width. Apply it from the center of your lips right out to the corners of your mouth and then add a little highlighter along your top lip to bring out the natural horizontal line of your lip. For more tips on shaping your lips, see our beauty article, Makeup Tricks: Shaping Your Lips.